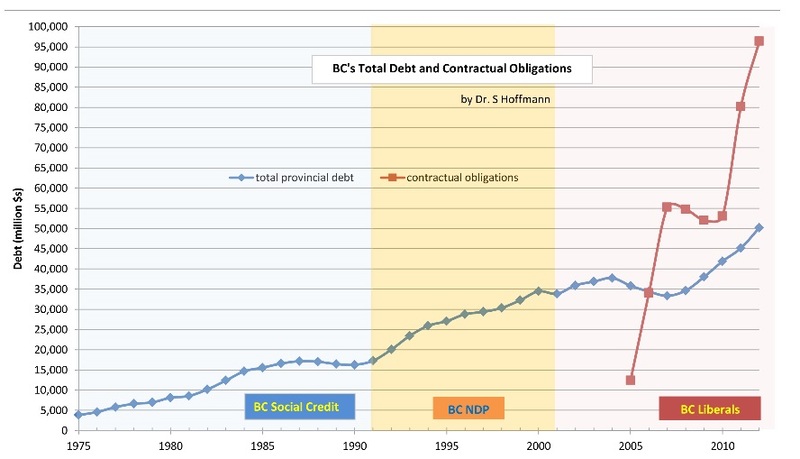 “BC Liberal Legacy: A Huge Debt Burden” ( aka, Christy Clark really has no clue what she is talking about) – Laila Yuile on politics & life in B.C. By now most of you will have heard of the soon to be departed premiers performance on CKNW this morning. Regardless, in a timely bit of serendipity, our friends retired economist Erik Andersen and Dr. Sandra Hoffman have one of the most important posts up today over at The Commonsense Canadian, and I strongly feel it should be read by every British Columbian. The debt chart above, borrowed from their post, is about as graphic as it gets of a visual on what the Liberals real debt legacy is.. and it isn’t pretty. It might be instructive to the citizens of BC to have a financial report card on their Provincial Government before casting their vote in the coming election. 10. Responsible, accountable management of your public resources and tax dollars. And share this with everyone you know. In fact, I would suggest printing off this graphic chart on their site and share it as well, on bulletin boards, at work, with neighbours. I lost count how many times I burst out laughing. This person has absolutely no shame at all. Not one word that comes out of her mouth has any truth what soever. ” The First thing I did when I became premier was to bring spending under control”…..now that is a laugh out loud moment! Thank you for bringing up Clark’s taxpayer paid credit card again. You broke this story last year. Still angry at our corrupt right wing so called media for ignoring some of the most grievous and only focusing on her approx $12,000. restaurant bills. The media totally ignored vet bill charges, Bosleys pet supplies, Beadworks ($800.for bead supplies? ), $600. iTune downloads, DAY SPA, Lululemon etc? There was even a tombstone ordered from Stewart Monuments in Victoria that was billed to us and totally ignored. Get real! There is too much that is questionable in the expense report. Some serious gorging at OUR trough going on. That comes to $1310. a day for expenses most don’t earn that in a week . Between the LAMC fiasco, gov’t credit cards being paid without any receipts or proof there is some egregious behaviour going on. Net Zero for us but skies the limit for them? Hypocrisy at its finest. The Premier’s Office wasn’t the only government department that recorded a significant jump in credit card charges. According to records, the credit card bill for the ministry of energy and mines, Rich Coleman’s portfolio, jumped by $372,936 to $737,382. The ministry of transportation and infrastructure, Blair Lekstrom’s portfolio, increased by $1 million to $6,696,069. And they totally ignored Falcons which I went through and found many questionable charges. Clark’s interview was another embarrassment her team of sycophants will claim as a huge victory. He fumbling, stumbling Palinisms are difficult to listen to at the best of times, but the sheer gall of openly lying is disgraceful. Christy Clark will say and do anything, except speak the truth. Prtetty well all politicians will bend the truth at times, and some will tell untruths more often. But she lies right out in front of us and disrespects our intelligence by thinking we don’t recognize crap when it goes wafting by our noses. All of the lies are documented Christy. They didn’t get deleted. And Mosko, for the life of me, at this point I simply cannot understand why those sycophants are still wallowing in her wake. Denial I suppose. After reading this information, I am appalled that Clark can lie with such impunity. Voting day can’t come any sooner. These are the direct (MP3) audio files from the ‘NW servers to listen to and/or download/email/share. Right-click on the links to save/download/share/email, or just click and listen to her nonsense. Bill Good just supplied the rope. Christy Clark: “Nice to hear from you again Sam. Even Bill Good started to sound disgusted by the end of this mornings interview with Clark. Simi Sara was fact-checking everything that Christy Clark said this morning on her afternoon show. Christy Clark should never have dumped all over CKNW radio in front of over a thousand people at last summer’s BC Liberal BBQ. Now it’s pay back time. So much for loyalty to you, the CKNW listener. I guess you, like me, were an idiot for thinking Christy Clark might be a breath of fresh air in Victoria. I guess you, like me, were an idiot for thinking Christy Clark was bright as a politician. I guess you, like me, were an idiot for thinking that Christy Clark could get more out of her Cabinet, get more out of her Liberal MLA’s, than Gordon Campbell. I guess you, like me, were an idiot for thinking she could make our provincial government work better than it did under Gordo and his arrogance in springing the HST on us, and trying to talk his way out of it. I include you in this listener because right now you are listening to CKNW. By the way, I would like to thank you for listening, because it allows me to feed my family. Just like your listening allowed Christy Clark to feed her son when she was a host here. On Saturday at a political barbecue in the Surrey riding of Finance Minister Kevin Falcon, Clark spoke to BC Liberals, and she mocked Vancouver Sun political columnist Vaughn Palmer, and she then mocked you, the listener for tuning in to CKNW. I presume Christy Clark doesn’t like the criticism she’s been getting from the likes of Vaughn Palmer and Michael Smyth and Philip Till and Bill Good and Simi Sara and Jon McComb and Jill Bennett and Sean Leslie and yours truly. I presume Christy has decided that things are going so poorly for the BC Liberals under her leadership that it’s time to blame the messenger. “It’s not our fault, dear Liberals, it’s that unsympathetic, pro-NDP media…that’s the problem.” Rather than try and answer the criticism, it’s easier to crap on the messenger. My, how things have changed. Remember when Christy left CKNW, how she spoke so glowingly about you, the CKNW listener? Remember how she had so much respect for you, the CKNW listener, who tuned in to her show every day? She of course knew darn well that CKNW and you, the listener, gave her a platform that raised her profile so she could jump back into politics. We thought she was bright…..she sounded articulate….and we all understood when she went left radio to seek the Premier’s job after Gordon Campbell resigned. Boy, were we wrong. Now, she insults the CKNW listener. Nobody listens to CKNW any more, right? Loyalty. Funny word, that. Damned hard to earn, but easy to say, and it appears easy to piss away. Loyalty. Now it seems to me that if I she really respected you, the CKNW listener, she would come on air and take on the likes of Smitty or McComb when they criticize. She would make her argument and let you, the listener, decide. But no, not Christy. Yet again, Christy Clark showed on Saturday she’s willing to say anything to anybody to get their vote. But speaking as one who clearly misjudged her talents as a politician, a word of warning. When times get tough, some people stay true to their word. Others, like Christy, don’t. One final thought Christy. Can you say Kim Campbell? Christy Clark is a sociopathic,pathological lying sack of feces. My fervent wish is that come the day after the election, she and a few other undeserving Liberal lick spittles survive to sit in the Legislature. To be shouted down and mocked every time they try to speak. All while an investigation into BC Rail and the Basi Virk “buyout” eats her alive………. I heard Adrian speak in Chilliwack last week and he was humble and self-deprecating. Christy, by comparison, is pompous and self-defecating. Laila, thanks for your ongoing honest assessment of our current political environment. I once had some involvement with a couple of crafty politicians who had the attitude, “…as long as I get publicity, good or bad, people will recognize my name at the polls and I’ll get elected..”. Now, there are easy ways to confirm most of their public statements, but both Harper or Clark continue to believe any publicity is good publicity. Sure they have their CORPORATE spin doctors manipulating behind the scenes, but the public is much more clued-in than ever before. All thanks to blogs like yours. Thank you rmaharg, sorry for the delay, long day. Very kind words.We are at a crucial point in this province where every move counts more than many people think. No free passes. Erik and Sandra did amazing work here. And hugs back to you too Irene! Thank you for sharing the word! I thought it might be useful to add a little clarification to those studying the graph. I came across the “Contracted” amounts by accident in 2010 when the Auditor General included these amounts and a graph in one of his reports. I knew the IPP contracts were not been presented as long-term financial obligations and I suspected contracts like the Sea-to-Sky shadow toll contract were also not being reported as long-term debt. Upon getting a direct answer to my queries from the Auditor General he confirmed that the amount was $96.4 billion a year ago and that I was correct in thinking that this total was seperate and additional to the $70 billion the government’s report of a year ago showed. So when looking at the gragh it is important to realize that the two items need to be added to get total provincial liabilities of a year ago. Two years ago the S&P Credit rating agency warned provincial governments that debt levels were getting too large, too fast and that higher revenues were needed. Also that health care and education budgets needed tighter control (read shrinking). There is a case to be made from the evidence that public education and health care are being deliberately placed under fiscal attack in the interests of seeing these services driven into private hands, much as in the USA. The fiscal vectors evident from the past 6-8 years cannot be excused as accidental. Thanks for this Erik and I think your assessment of the situation is absolutely bang on. Look at what the Liberals did by slashing taxes as low as they did when Campbell came in. Sure they brag about having the lowest taxes..but what they don’t tell you is that it left a huge, massive hole in the provincial revenue. In essence, they created their own crisis, and next thing you know corporate pals like SNC Lavalin. Macquarie and Kiewet are in on one of the most lucrative P3 markets in Canada, courtesy of the publics dime. Excellent work, excellent Erik. My thanks to you and Sandra. Now: The Big Christy Machine in Chilliwack!!!!! Let us not forget that Crusty Clark likes to bottle fart gas and does experiments with beer cans and breasts – Wow, what wisdom. What a leader eh ! Enuff said and I doubt that she knows what day it is without the help of her many assistants! Isn’t there some kind of law against politicians who lie to the electorate? If there isn’t, there should be. Perhaps, when the NDP get elected, they can bring that up in the legislature, possibly get a bill passed so that liars like Christy and Gordo will be facing big fines, or even jail time. Hello Paul; Not sure why you inflicted people with this interview but just so you know Rick and his team have blocked all messages from me. I suspect it is because I have been less than fawning which is what they seem to need. Rick is pretending to be investigative but starting off with the $11 billion number just means he and his team have willfully ignored the public evidence the formally most honest person in BC has given us; ie the Auditor General. When Rick and his team rise to a higher level of investigative journalisim then by all means let us hear.But until then they are just part of the problem and not part of any solution. I’m sorry if you felt inflicted by the publishing of the audio links of the Christy Clark interviews I supplied. I usually don’t pay too much attention to morning radio but this is week two of an important election campaign. I intend to keep right on supplying every bit of audio that comes out of Christy Clark’s mouth. Whether my links/posts are published or not is Laila’s call. Rick Cluff’s investigative journalism is irrelevant to me right now. I don’t know if Rick Cluff has any journalistic integrity or not, but Rick Cluff is not seeking a mandate from the people to lead this province. I’m interested in hearing Christy Clark refusing to give straightforward answers and flat-out lying when even a little pressure is applied no matter who asks the questions. I’m not going to wait until after the election for “Rick and his team” to rise to a higher level of investigative journalism. Rick Cluff has been the host of The Early Edition since 1997 so if it’s not broke he’s probably not going to fix it anytime soon. ‘”We have balanced the budget,” Ms. Clark insisted, once again. No member of the press should be protecting this premier,or her colleagues from public discourse or preventing the facts from being revealed. Re the Andersen/Hoffmann report: breathtaking, frightening. If you set out to ruin a province, put it in a hole so deep that will take years to climb out, you couldn’t be more evil and ruinous than the BC Liberals have been. Don’t really think Christy Clarke is stupid about all of this, but she is too willing to be Gordon Campbell & Co’s tea-party liberal apologist and too willing to tell the lies and take the heat and spotlight off those who deserve the blame … the cowards that have already bailed out/or are sticking around to ensure they will be retiring with lucrative pensions on top of their years of payola … this is what makes Christy Clarke contemptible. Wasn’t it an American republican/tea-party tactic to put the government so far into debt with military/industrial spending that no future party/government had room to govern according to policy and principles? Aren’t the tea-party Liberals leaving a short fuse on finances that will detonate a few days after the election on May 14? Yes, correct Karen. The new government will be getting a poisoned financial chalice. The BC auditor Generals have been nagging the government for over a decade to fully disclose the financial condition of the provinces finances. By accident I picked up on the AG’s 2010 report documenting “Contingencies and Contractual Obligations”. His recent responce, when asked if the $96.4 billion included any of the amount shown in the government’s own report of provincial liabilities, $70 billion, he confirmed no. When these numbers are found in multiple year public reports that no one bothers to investigate but who want to talk about finances publicly, it is worrisome. After over ten years of the AG giving the government a “Qualified” grade on their annual reports it gives a new meaning to the term “slow learners” or just possibly something more sinister is the truth. The Premier’s present stratgey is to demonize the NDP as bad fiscal managers yet when the evidence is examined, the Liberals have set us up for a “Greek” or “Spanish” experience. For Rick to begin an interview by asking about a $11 billion increase in debt it is worse than insulting to his audience and rightly has people asking if the CBC is just lazy or willfully ignorant. Pingback: 100 Reasons Not To Vote BC Liberal | Blogwire Media – Bringing you the latest news and top stories from around the globe.